This meter's ability to process 40,000 incoming data points per second will mean no more need for manual x, y, and z readings or calculations. The NFA 1000 will now do this work for you delivering precision tri-axis peak readings. When combined these features make fussy documentation and calculation procedures a thing of the past. 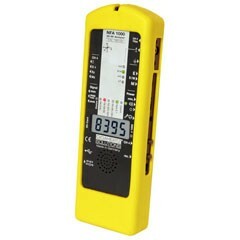 The built in memory function is designed to manage a large volume of successive measurements. The audio input feature allows the technician to record and store any observations or notes made during the measurement process. A memory card and PC compatible evaluation software are part of the package that will allow the technician to transfer data from the meter to a PC. PC interfacing capabilities allows for 'real time' review and in depth analyses at a time convenient for the technician. Body Voltage capabilities available at a flick of a switch eliminates the need for additional meters. In addition to the EMF data logging feature, interfacing capabilities with the HFE59B (RF Analyzer) allows for data logging of radio frequencies. A 'no tamper' lock feature allows for the device to be left securely on site while data logging is operational. Customized Geiger Counter: Allows for a personalized volume and high exposure alarm.